Tonight Chicago Teachers Union President Karen Lewis announced that the CTU will be on strike tomorrow. Among the major issues is the new teacher evaluation system that the city is trying to implement and the city’s insistance on eliminating steps and columns in the teachers’ contract. There is no overstating the importance of this situation to all public school teachers across the country, including those in Comsewogue. 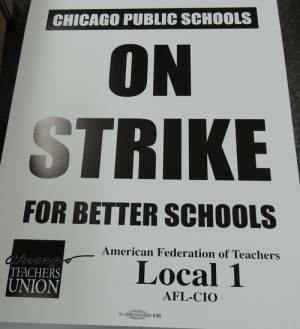 The Port Jefferson Station Teachers Association is proud to stand in solidarity with our brothers and sisters in Chicago. Wear red tomorrow.